GOODYEAR, Ariz. (AP) — Ramon Santiago singled home a run, stole second and scored on a wild pitch to help the Cincinnati Reds beat the Colorado Rockies 3-2 on Saturday. 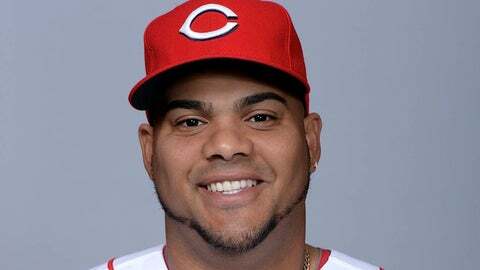 Brayan Pena doubled and scored on Santiago’s single. Neftali Soto doubled in a run for Cincinnati. Pena and Santiago both played for Detroit last season. Nolan Arenado had three singles and an RBI for the Rockies. Former Reds infielder Paul Janish singled and scored two runs. "Arenado looks good. He has his legs under him," Colorado manager Walt Weiss said. "At times last year he got away from using his legs. I don’t worry about Nolan." The game was played despite the first rain in the Phoenix area since Dec. 21. Billy Hamilton, Skip Schumaker, Brandon Phillips and Zack Cozart were scratched from the original Reds lineup due to wet conditions. Colorado was informed the game was on shortly after 11 a.m., leaving the Rockies enough time to make the 45-minute trip from Scottsdale. Chien-Ming Wang pitched for Cincinnati for the first time this spring. He allowed one run and five hits in two innings, striking out two. The 34-year-old right-hander from Taiwan was signed in the offseason to add rotation depth. He is working on off-speed pitches to complement his sinking fastball. "I am very happy to be in the major league camp," Wang said. "I mixed in more changeups and change of speeds. The whole spring I’ve been working on the changeup and curveball." Rockies: Jordan Lyles made his first start for Colorado. Lyles came to Colorado with Brandon Barnes from Houston in an offseason trade for Dexter Fowler. Lyles allowed two runs, one earned, on three hits in two innings. He struck out one. "It went well for the first time," Lyles said. "It was the first time I got to work with Jordan Pacheco. It is going to take some time. Spring training is long but it is needed to let pitchers and catchers work together." Weiss is also getting to know his new pitcher. "He has a live arm," the manager said. "When he keeps his fastball down he gets a lot of groundballs." Reds: Tony Cingrani pitched two scoreless innings for Cincinnati. The lefty, who filled in admirably for an injured Johnny Cueto last season, is working on a slider to go with a live fastball. Cingrani threw a higher percentage of fastballs than any other pitcher in the majors besides CC Sabathia last season. Cingrani struck out the side in the second inning by mixing in his new slider. "I had a lot of zip but I attacked hitters with the off-speed pitch," Cingrani said. "I was talking with Sean Marshall about using the same arm slot so it looks like a fastball. It will be a real good pitch for me." Reds manager Bryan Price liked what he saw. "Cingrani was sharp," Price said. "He got his changeup over and threw a couple of good breaking balls. He had good fastball location. It was a good start for him." Rockies: Colorado outfielder Drew Stubbs expects to return Sunday after missing two days with eosinophilia esophagitis, a recurring condition for Stubbs that usually clears up in two days. This bout was bad enough that Stubbs went to a hospital for treatment. Left-handed reliever Boone Logan is playing long toss but expects to throw his first bullpen session early next week. Right-handed starter Jhoulys Chacin has a strained right shoulder. He expects to resume throwing in a couple of days. Reds: Mike Leake was scheduled to start Sunday against the Padres but was scratched due to an abdominal issue. "He did something in his workouts we didn’t know about a month ago," Price said. "It didn’t cause him any problems with his bullpens or his lifting. He felt something in his long toss before his last bullpen. We’re just being real cautious with it." The rain restricted some Reds players recovering from injuries. Jack Hannahan (right shoulder) hit in the batting cage. Rockies reliever Matt Belisle allowed a run and two hits in one inning against his former team. Belisle has appeared in more than 70 games for four straight seasons. "Matt is trying to pitch inside and work on his changeup. They go hand in hand," Weiss said. "I expect his role to be pretty much the same with us this year." Rockies right fielder Kyle Parker had a single in four at-bats against the Reds. Parker grew up in Jacksonville, Fla., but was born in Ft. Thomas, Ky., less than 10 miles from Great American Ball Park. His father, Carl, was a wide receiver for the Cincinnati Bengals when Kyle was born. Carl Parker played two seasons, 1988 and 1989. He was a member of the Bengals’ 1988 Super Bowl team.